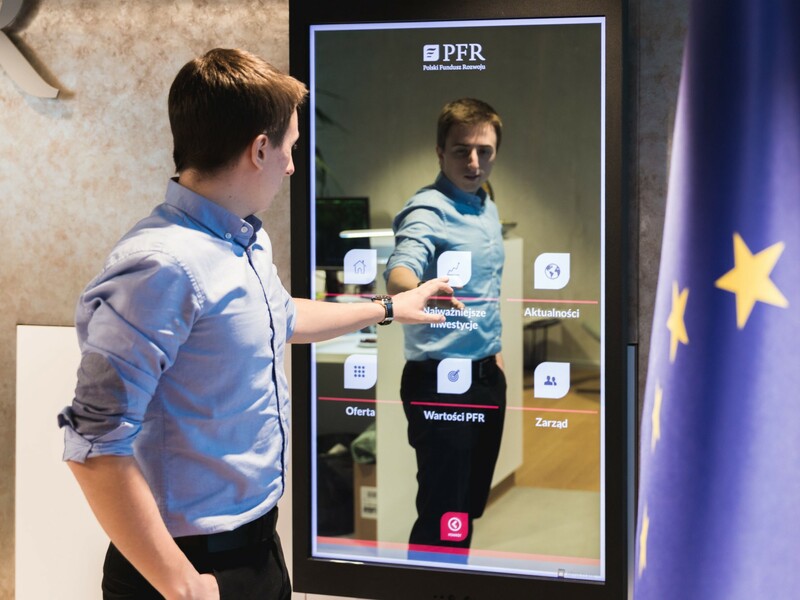 The interactive mirror in the hospital allows patients to make an appointment with doctors and pay for the visit. Also, the smart mirror shows the way to the office. • a comfortable form of registration. 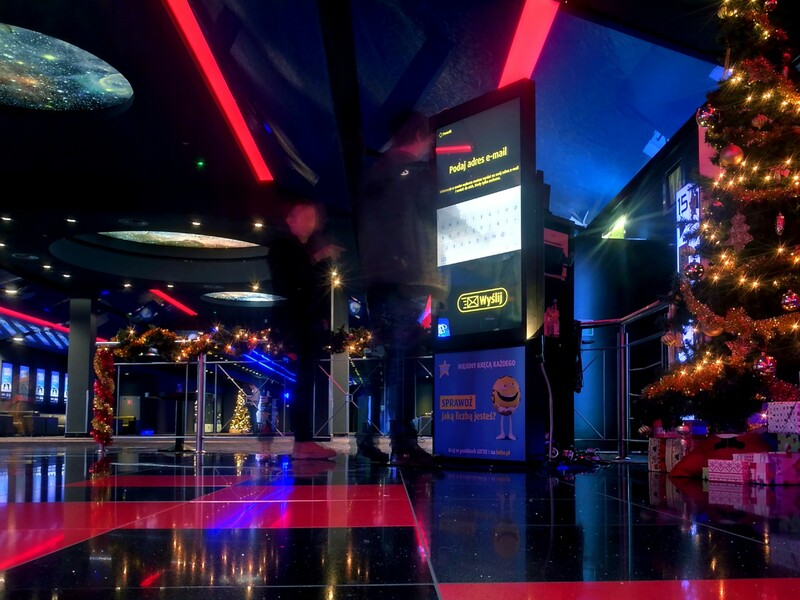 In 30 branches of Alior Bank Abyss Glass installed 50 interactive mirrors that display promotional videos about bank’s offers and products. Clients can approach the mirror and by using the touch surface, learn more about the offer. • optical enlargement of the bank’s area. 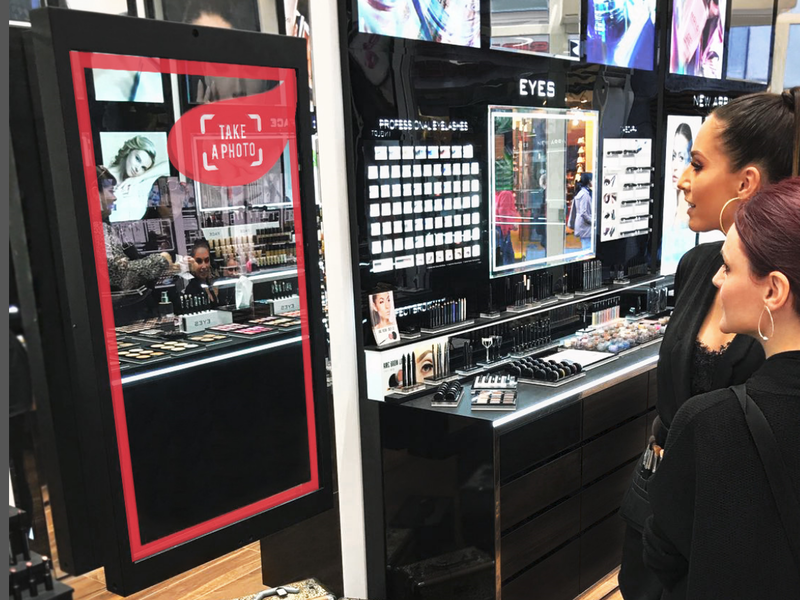 Interactive mirrors in INGLOT showrooms have a “photo-booth” application installed, which shows the client how they will look in a given make-up. The person in front of the mirror chooses the products that will be used to create virtual make-up. The effect is displayed in the reflection, and the photo can be sent via e-mail. • involvement of the target group. 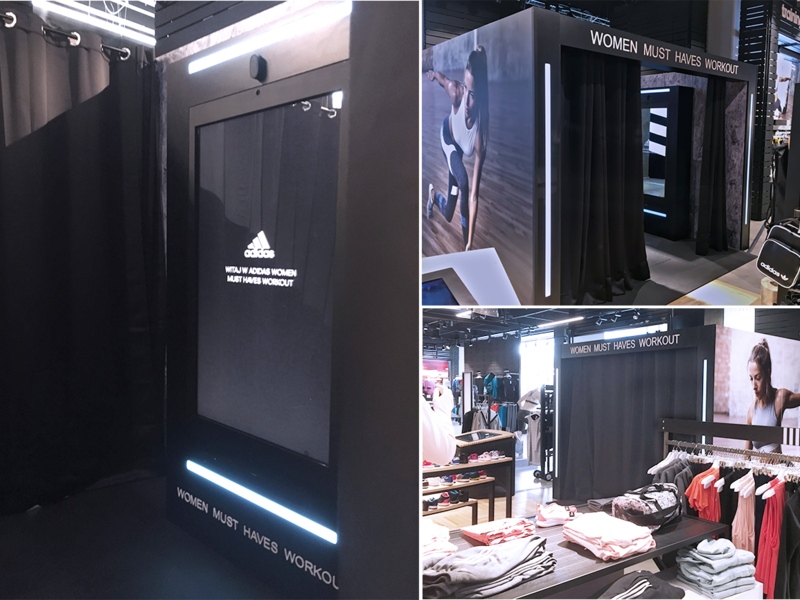 Fitting rooms with Abyss Glass mirrors inside, are a part of especially prepared promotion for Adidas Women project. Women during the workout with Ewa Chodakowska are able to test the comfortability and durability of Adidas clothes. In the meanwhile, sensors in mirrors measure the intensity of exercises and show the results at the end of the workout. • distinguishing the offer from the competition. 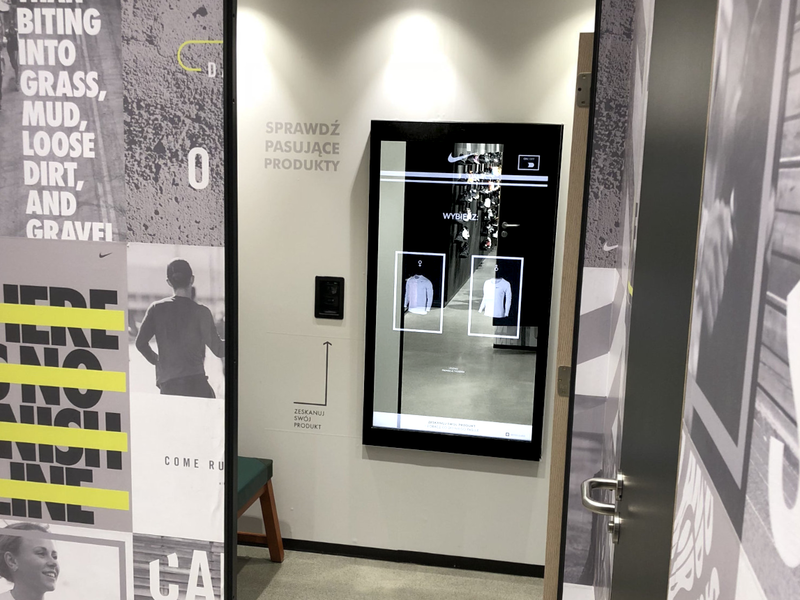 Interactive mirrors, installed in the Nike’s salon in Wroclaw, has the modern technology, allowing the customer to see all of the information about the products they brought inside the fitting room, on the mirror’s surface. Within one touch, customers can ask the staff to bring different size, or colour of the product they are interested in. All you need to do, is to scan the label, and the content will automatically display on the screen. • possibility to promote selected clothing models. 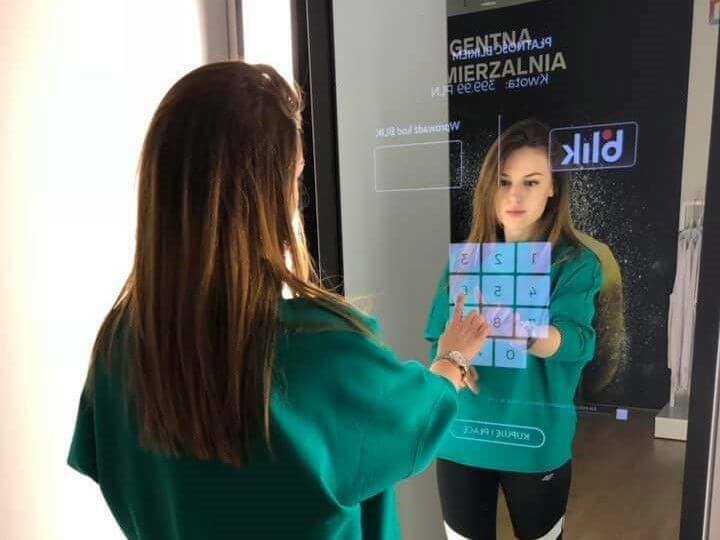 For the 4F brand our team has developed an interactive mirror that has changed the usual store fitting room into innovative and intelligent ones. Thanks to RFiD technology, all products that the customer has brought to the fitting room automatically appear on the mirror surface. The user could easily find out more information about them, order a different size, color or other matching product. Moreover, he could pay BLIK- directly from the mirror without waiting in line to make payment. For french pharmaceutical company, producing anti-aging cosmetics, Abyss Glass created an application called “Aging”. Its purpose is to show the users how older their face will look in 30 years, so they are encouraged to take care of their skin. It also shows the information about the rejuvenating properties of the product. • distinguishing the company’s offer from the competition. For Sports Totalizator LOTTO our team has developed a photo-mirror, which displayed the brand's hero in the form of animated balls from popular drawing machine. The camera recognized the gender of the participant and attributed to him a selected ball from Lotto with the number, specifying "what number you are". Event participants could take a commemorative photo, print it on a professional photo printer and send by email. Each photo featured a lottery branding with promotional information and a previously fitted animated ball with a description of its character. The mobile, mirror totem is a showcase on promotional events. Modern shape and elegant, black finish makes it perfectly fit into many business interiors. It attracts attention with size and interactive graphics. Abyss Glass updates the displayed content on a regular basis. Installation of totem mirrors in the reception of new PFR offices. On their surface information about new investments, participation in events or received prizes is displayed. A mobile totem was also created to promote PFR during fairs and other occasional events. 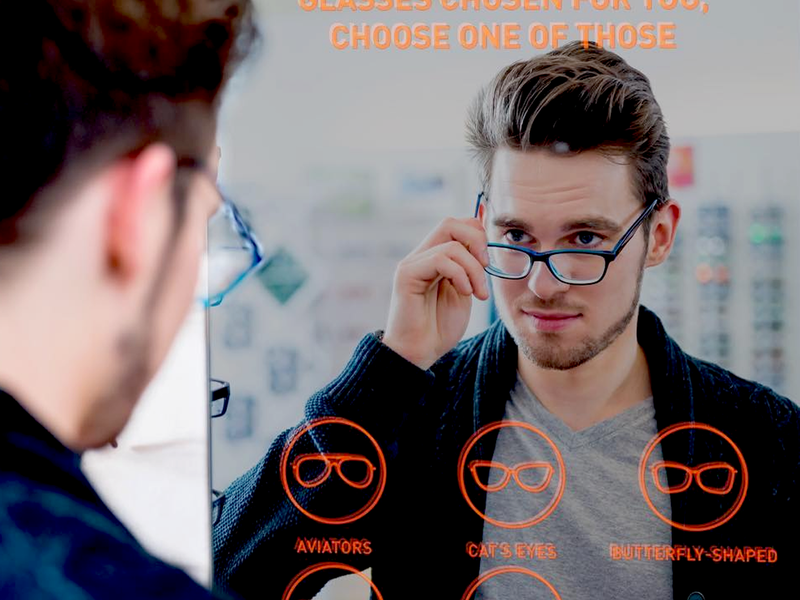 The interactive mirror in the VISION EXPRESS salon allows you to adjust the frames of the glasses based on the gender and shape of the person’s face. The installed application selects a model that matches a given type of beauty. The entire process takes only a few seconds. • an interactive and attractive element of the store’s interior. 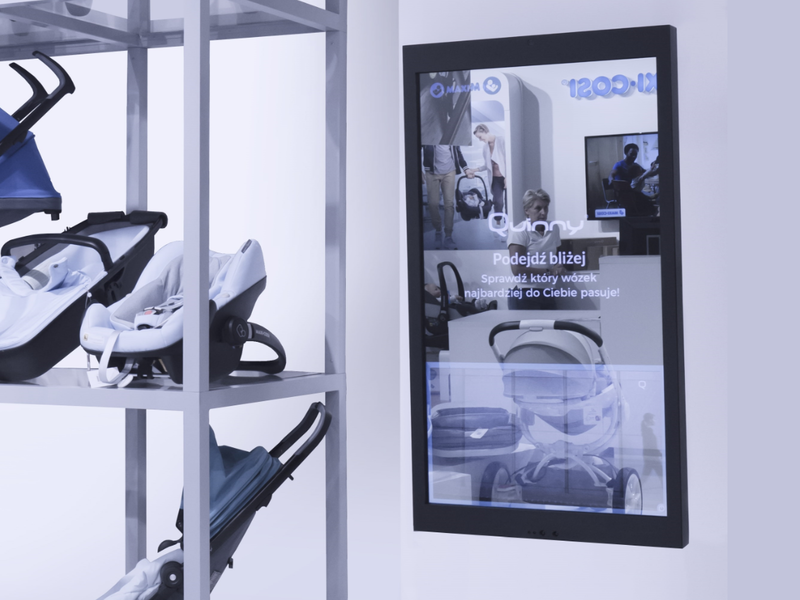 Increased sales thanks to personalized content displayed on the surface of the mirror. In the toilets, after the approach to the toilet sink, advertisements of individual products tailored to the time of day were presented. For the iComfort company, our team has created a mirror with non-standard sizes. The height of the mirror is over 3m. 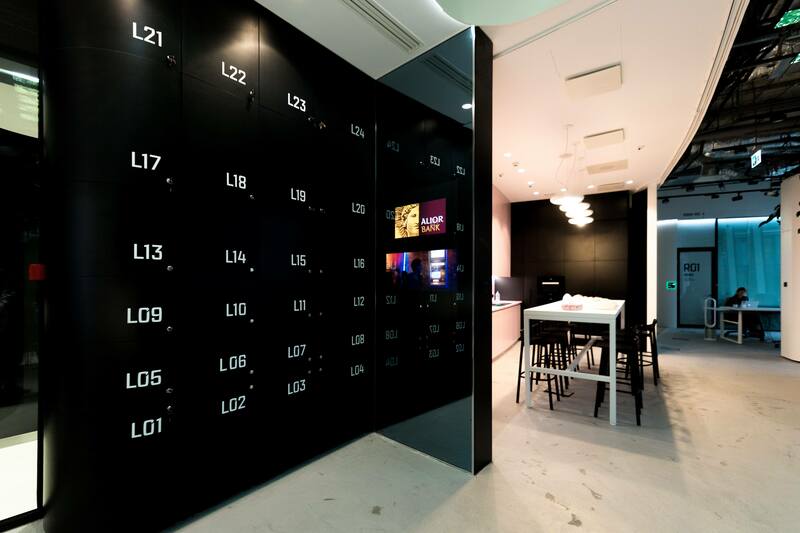 The mirror displays materials promoting Alior Bank Innovation LAB. 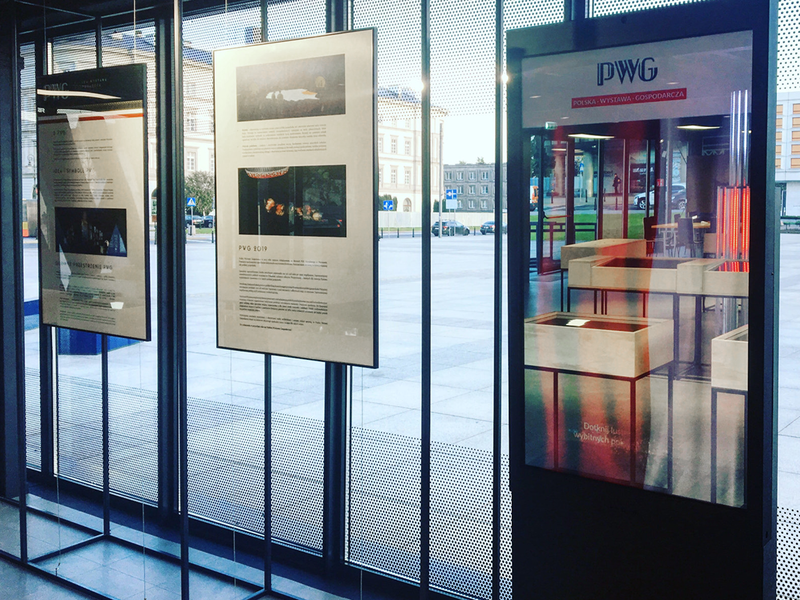 The installation is located in the prestigious "Warsaw Spire" skyscraper at Plac Europejski in Warsaw. 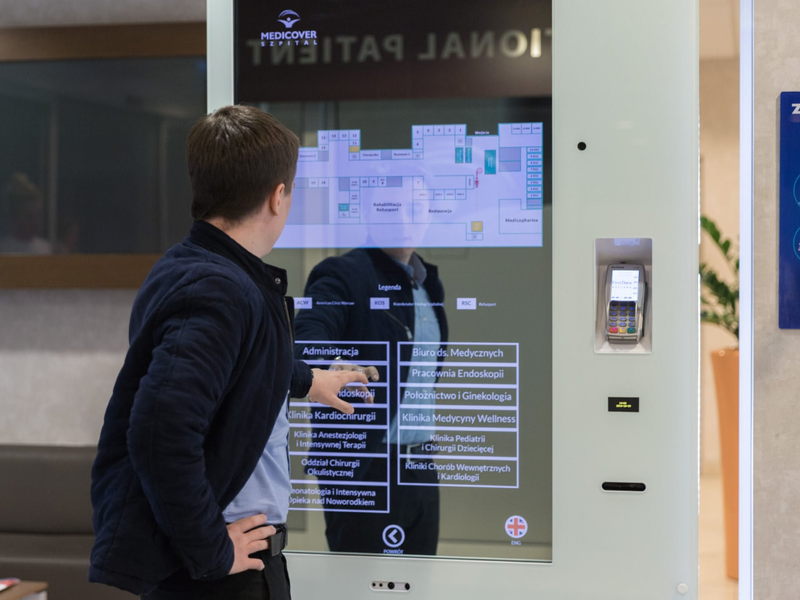 The company’s offer is displayed on the mirror surface and after approaching a cart, you can see detailed parameters of a given model, available colour versions and additions. The built-in camera allows you to make photos and sending it to an email or sharing on Facebook. • customer satisfaction with high quality of the shopping process. Advertisements on the mirrors mounted in public toilets in the city centre of Katowice, reach up to 3,000 people each day. It is an interactive marketing medium, which immediately attracts the attention of visitors. 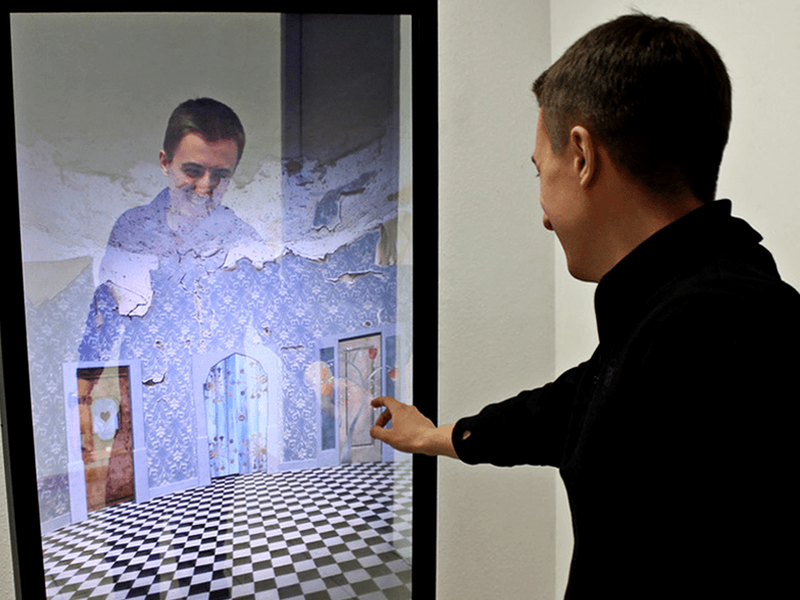 Interactive mirror with content promoting Polish inventors naturally attracted the attention of the exhibition’s guests. Passerby after approaching, had the opportunity to get acquainted with additional information about the inventors, thanks to three-dimensional and friendly graphic design. • friendly form of learning. Installation of an interactive mirror in private apartment. The device perfectly matches the raw decor and white walls, it presents itself modern and luxurious. 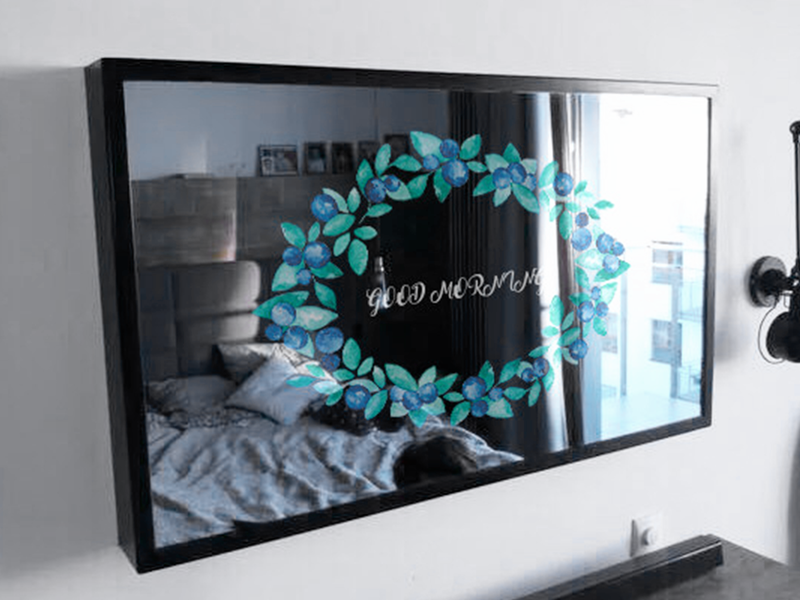 Technology allows turning the mirror into a TV screen at any moment. ABYSS GLASS GROUP SP. Z O.O.